Pep Rosenfeld and Andrew Moskos perform with Boom Chicago. The group’s founders have made the comedy troupe an international force, and hold the honor of being the only visiting group to have performed on the Second City mainstage in Chicago. It was the summer of 1992. Andrew Moskos and Pep Rosenfeld were kicking off their postgraduate European adventure in Amsterdam, and, naturally, they decided to sample some hash in a Dutch coffee shop. The two men were struck with an idea: Why not open a comedy club in Amsterdam? While most people would dismiss this as the drugs talking, Moskos (WCAS ’90) and Rosenfeld (WCAS ’90) actually followed through, and spent the next year recruiting performers and writing to the Dutch tourism office for feedback. Now, 25 years later, their brainchild, Boom Chicago, is thriving. At its upcoming anniversary show this July, the Boom team will feature 25 years of alumni at the Carré Theater, one of the largest venues in Amsterdam. Notable alumni include NU favorite Seth Meyers (Communication ’96) and Jordan Peele of “Key & Peele.” Meyers is planning to attend the reunion and will be performing a stand-up show. Boom Chicago’s fame extends outside of Europe: It’s the only visiting group to have performed on the Second City mainstage in Chicago. Moskos and Rosenfeld are Evanston natives who grew up going to Second City shows, so their experience performing there was “something between astounding and crazy proud,” Rosenfeld said. 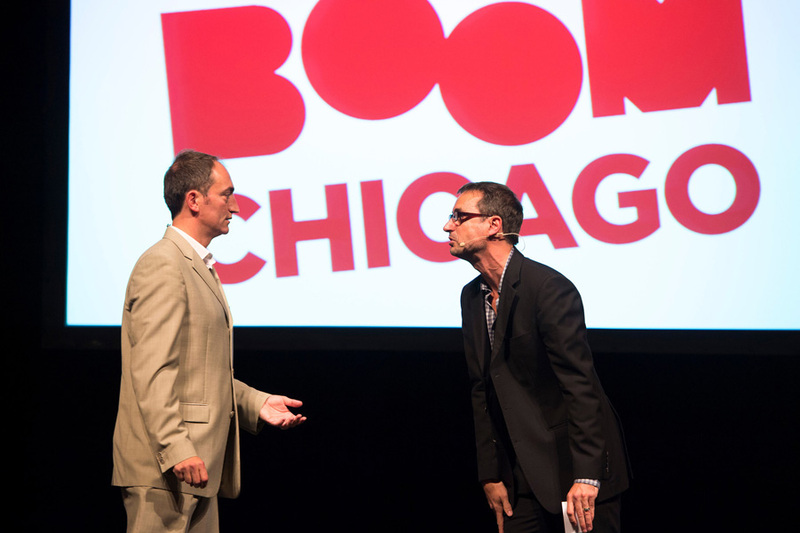 Rosenfeld said Boom Chicago’s set-up was inspired by the creative design of the Second City and Northwestern’s Mee-Ow show. He performed in the Mee-Ow show his senior year, and described it as a life-changing experience. During his NU days, Moskos was just another happy audience member in the sweaty Shanley Pavilion. After watching his friends perform in the Mee-Ow show and at iO Chicago, an improv school in the city, he decided to take some classes there himself after graduating from NU. Moskos and Rosenfeld said there was no improv or comedy presence in Amsterdam when Boom Chicago first opened. Though they said they were attracted to the idea of being “bigger fish” in Amsterdam instead of “getting eaten” in another city like London, the Dutch tourism office and arts scene did not initially agree. The tourism office warned them that Dutch audiences would not want to watch a comedy show in English, Moskos said, and the two were unable to find a theater to host their show. In the summer of 1993, the first Boom Chicago show began running Thursday through Sunday nights in the back of a “funky old salsa bar,” Rosenfeld said. He said they attracted an average of 50 people per show that summer. The next summer, they rented a larger space. They then moved to a black box theater for a few years after, then finally found a more permanent venue in the Leidseplein Theater in 1997. Moskos and Rosenfeld initially flew out to Amsterdam to perform in the summertime, leaving the Boom Chicago office in the care of Saskia Maas during the rest of the year. Maas, now the CEO of Boom Chicago, connected with the men through Moskos’ brother in 1993. Maas said she eventually got sick of fielding calls from customers looking for tickets during Boom Chicago’s off season and decided the group needed a year-round venue. At the Leidseplein, the company was able to evolve into a 100-person operation with a kitchen, a bar and shows year-round, she said. Moskos said the Leidseplein Theater is located in what could be called the Times Square of Europe — full of action and very “touristy.” However, Boom Chicago is not exclusively geared toward tourists. Rosenfeld and Maas referred to Boom Chicago as a group of “insider-outsiders.” They are able to appeal to locals like Maas and expats like Moskos and Rosenfeld, as well as tourists who were just like the two themselves used to be. Rosenfeld said the early Boom Chicago shows featured touristy sketches about getting high in coffee shops and touring the Heineken brewery. Nowadays, their comedy is more nuanced. Moskos said the level of engagement in American politics by Boom Chicago’s audience is a testament to the Dutch being informed about current events outside of the Netherlands. Past shows with political themes have included “9/11 Forever” and “Trump Up the Volume,” a show that was meant to play on the 2016 election and has since become Boom Chicago’s longest running hit. Over the years, Boom Chicago has sparked creative relationships and started careers. At the Second City comedy swap, Jordan Peele met Keegan-Michael Key — who was in the Second City’s mainstage troupe at the time — and a comedic duo was born. Other highlights include Seth Meyers’ “Pick-Ups and Hiccups,” a show about relationships that he co-wrote and co-starred in with Jill Benjamin, another Boom Chicago alum. The duo performed in Edinborough, London and Chicago. It was at their Chicago show that Meyers was discovered by “Saturday Night Live” scouts, Moscos said. “We’re always very proud that Seth has only had two employers: Boom Chicago and NBC,” Moskos joked. Maas said she often feels like a “proud mother” of her “Boom Chicago children.” She said she is proud of their accomplishments, most recently Peele’s Oscar nominations for “Get Out;” and she also appreciates the “automatic bond” that the alumni network shares. For the past five years, Boom Chicago has been performing at the Rozentheater, located in a trendier part of Amsterdam. Moskos said it is their nicest venue yet, with two theaters, a bigger bar and, due to the location and size, more artistic credibility than they ever had at the Leidseplein. Boom Chicago’s most recent development is an escape room attraction called “Escape Through the Movies.” Moskos and Rosenfeld said after going to an escape room in Budapest a couple years ago, they thought they could create a better one themselves. Once again, they feel their daring creativity is paying off. A previous version of this article incorrectly identified Moskos. A previous version also mislabeled the escape room. It is named “Escape Through the Movies.” The Daily regrets the errors.